The fourth meeting of the International Phytoplasmologist Working Group (IPWG) will take place in Valencia, Spain - September 8-12, 2019. The second circular is available and further information can be found in the meeting website. 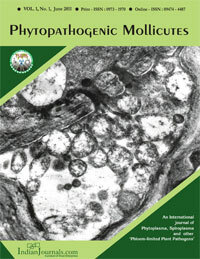 Phytopathogenic Mollicutes journal is a half yearly official publication of the Technology Society of Basic & Applied Sciences (TSBAS), which will promote the interdisciplinary exchange of knowledge and ideas in recent researches on phytoplasma, spiroplasma and other ‘phloem-limited plant pathogens’. The journal is unique of its kind because no journal in the world is available which covers all aspects of mollicutes viz: characterization, diseases, management, pathogen genes and genomes, taxonomy, evolution, host parasite interaction, transmission, vectors, epidemiology. This journal is being published by Indianjournals.com. The Phytopathogenic Mollicutes is planned with every aim to provide a high profile vehicle for publication of the most innovative, original and rigorous development in the basic and applied research on mollicutes. Interdisciplinary studies of fundamental problems on the subject are given high priority. The structure of the journal takes into account the broad scope of R&D in phytopathogenic mollicutes research. Thus in addition to its full length and short papers on original research, the journal also includes regular features on editorial, review articles, meetings, scientific correspondence, new developments, current references on the subject from other sources and book reviews. TROPICSAFE project will address three economically important diseases of perennial crops (palm, citrus and grapevine) grown in tropical and subtropical areas. University of Bologna will host the launching of the European TROPICSAFE project, which involves twelve countries around the world. It has been funded with almost four million euros from the H2020 programme. Bologna, 15th May 2017. To address three economically important insect-borne prokaryote-associated diseases of perennial crops (palm, citrus and grapevine) with the aim of providing innovative tools and solutions to manage and reduce the impact of these harmful diseases that are affecting and threatening these and other tropical and subtropical agricultural relevant species. This is the purpose of the European TROPICSAFE project involving three Italian entities: CREA, the company AGRITEST and University of Bologna (UNIBO) with the professor Assunta Bertaccini as leader of the project. Bologna will host the Kick-Off Meeting of the project at Alma Mater Studiorum, which will be attended by participants from twelve countries around the world (Italy, Spain, France, United Kingdom, Denmark, Slovenia, South Africa, Jamaica, Chile, Mexico, Ghana, and Cuba). The project will last for four years and has funding of almost € 4 million from the H2020 programme. TROPICSAFE project will deploy the knowledge and technologies available in the EU countries in tropical and subtropical regions for carrying out epidemiologic studies aimed at filling gaps in knowledge (including climatic and cultural factors), integrated pest management strategies based on innovative diagnostic and prevention tools, reduced insecticide treatments and pest risk assessment schemes. The project will evaluate the economical sustainability and the industrial relevance of the proposed solutions, as well as will assess the social impact of these diseases and the distributive effects in the target countries. Local plant protection organizations, farmers and producers will actively participate as partners and/or in the Stakeholder Advisory Board, taking part in field trials, demonstration and exploitation of the results.